The heart of shopping. Our blog on shopper marketing. You Scream, I Scream, We All Scream For Eyescream! It’s March and it is freezing, most of the country is snowed-in and the rest is hiding from the rain. So, it seemed natural for us to write about ice cream! 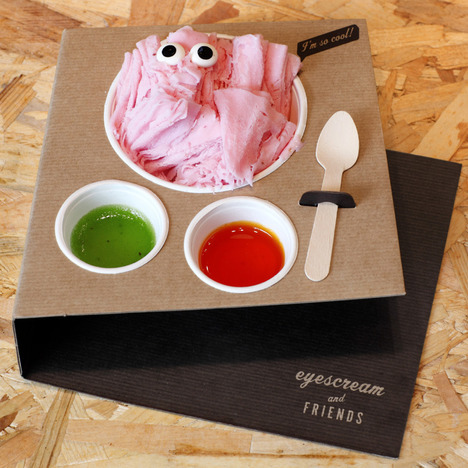 A new ice cream parlour, Eyescream and Friends, has opened in Barcelona. However this isn’t just any ice cream, as the old advert goes; this is shaved ice originating from Taiwan. A unique way of making ice cream creates delicate, soft ice cream, which is served with a variety of toppings. This unique dessert fits in perfectly with the trend for flavoured ice creams and frozen yoghurts that have come over from the US and are making their mark across Europe. However there is one major problem with shaved ice cream, it looks quite ugly; and to our western palates, quite unappetising. Introducing a foreign food product into a western market is full of challenges; unfamiliar flavours, textures and presentations can be very off-putting to shoppers and it can be difficult to overcome these purchase barriers. Localising food is an important step in making foreign food appealing to a new market. It was used by McDonald’s in 1996 when they entered the Indian market – to make traditional American food appealing to India, they tweaked their offering to suit their shoppers by removing beef and pork from their menu, adding Indian ingredients and creating local names like The Maharaja Mac and the McSpicy Paneer. 15 years and 250 stores later, the adaptation obviously worked. This same approach has been adopted by Eyescream and Friends; traditional flavours of shaved ice such as condensed milk or green tea were never going appeal to the Spanish market, so they created cheesecake, strawberry and chocolate flavours. Simplifying the presentation and altering the flavour make a foreign and off-putting food into something that sounds delicious. The shift means that they are making the new, familiar, and therefore reassuring shoppers to get them to try something new. To make the shaved ice more aesthetically appealing, a simple idea was struck upon, acknowledge how ugly the ice cream looks. Putting two sugar googly eyes on top of the ice cream mountain transforms it into a fun character-monster, immediately giving it life and personality. Turning each flavour into a character takes away the fear of trying something new and it appeals to the inner child. Creating a global-local balance, through bringing exciting ideas from abroad and making them locally relevant, is a tricky thing to do. Change the food too much and it loses all authenticity, but change it too little and shoppers are too scared to buy it. However, when it is done well, like McDonald’s, it can produce fantastic results. 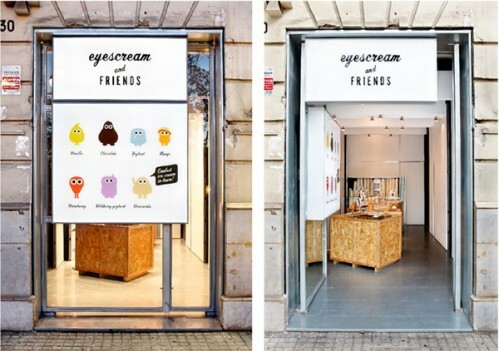 We hope that Eyescream and Friends have found that balance, and we can’t wait to go to Barcelona to try it out. Tags: Barcelona, Brands, Food, Ice Cream, Local, McDonad's, Shopping. Bookmark the permalink. Previous post ← A Dead Cat Bounce? Get set. Go save the high street.